His story is a dark tale of an innocent who has been chewed up by the fame machine and vaguely reminiscent of the prediction Gary Smith made about a 20 year old Tiger Woods in Sports Illustrated in 1996. “The machine will win because it has no mind,” he wrote. “It flattens even as it lifts, trivialises even as it exalts, spreads a man so thin that he becomes margarine soon enough. McIlroy has certainly lost his innocence but it’s not too late to recover his essence. Snuffling because of hay-fever, he’s making his first appearance on tour since he was chewed up by his frustrations in the US Open at Merion, where he threw a club early in his final round and then mangled another as he racked up a quadruple bogey eight on the 11th en route to a bitterly frustrating 41st place finish. There will be little understanding if he gives a repeat performance on the Montgomerie Course at Carton House this week, where he shot rounds of 71 and 81 as an amateur in 2005 but still skipped away with a smile on his face. Asked by an American reporter how he would manage the expectations of his countrymen this week and use the home support to his advantage rather than let it “suffocate” him, McIlroy nodded. The question struck a nerve. “Yeah, that’s actually a good word,” he said hoarsely. “That’s something I’ve felt in a couple of Irish Opens is suffocated and having that burden and that pressure and that expectation… it’s hard. There are few similarities between the Carton House that hosted the 2005 and 2006 Irish Opens and today’s challenge. Not only is the course more mature and far easier thanks to a more lenient set up, Ireland has four major winners in a field that is light on big names. Taking McIlroy and Graeme McDowell out of the equation and ignoring world No 67 Padraig Harrington and No 366 Darren Clarke, only three other members of the world’s top 50 are present - Ryder Cup players Francesco Molinari and Paul Lawrie, and defending champion Jamie Donaldson. It’s the perfect place for McIlroy to rediscover his mojo but many who saw him drag himself around Killarney with his chin on his chest on 2010 and 2011 will fear a repeat. “I guess there’s other ways to show disappointment,” McIlroy said by way of apology for his club abuse at Merion. “Taking it out on your golf clubs probably isn’t the right way to do it. “Of course everybody is going to get frustrated or angry or disappointed in a bad shot and obviously I’m no different. Life in the goldfish bowl has become too much for the Holywood idol since he signed his estimated $200m deal with Nike in January. But McDowell, for one, is prepared to make allowances for McIlroy’s failings from walking off the course after jut 26 holes in the Honda Classic to his show of temper in the US Open. “I can’t imagine what Rory has gone through this year,” McDowell said. “It’s tough to imagine that he can notch up the level from last year. What he was doing on the golf course was phenomenal. “His profile has definitely notched up a level this year and he’s now one of the most recognised athletes in the world, tossed in there with the Tiger Woods and Federers and Nadals and all of these amazing Nike athletes that we read about week in and week out. “It’s a lot to deal with for a young lad from Belfast, Northern Ireland who is at the end of the day just a normal kid. It’s a lot to deal with in that head, even though he’s a phenomenal golfer. “This is not about the golf; it’s about kind of the off course life, and there’s a period of acclimatisation. He’s incredibly good at it, let’s be honest. He’s taken it in stride, and you know, how many events has he played this year, ten, 12? It’s been a short period of time. McIlroy was going through a similar, mini slump 12 months ago but finished 10th at Royal Portrush and won his second major a few months later. Now he’s hoping the Irish Open can kick start another golden run. With two majors still to be played this year, McIlroy is a long way from writing off the year as a bad loss. But while Paul McGinley and Padraig Harrington reckon life would be easier for him if he accepted that he’s a roller-coaster player, McIlroy wants to contend every week. “I’m a good enough player to give my myself chances to win week in, week out,” he said. Irish golf fans will be hoping this is one of those weeks. Rory McIlroy has set his sights on becoming the youngest Irish Open winner in history and taking a giant step towards a Dubai double. 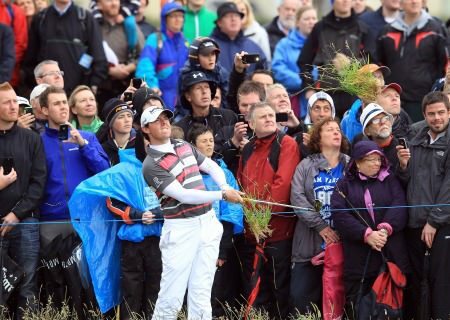 Rory McIlroy will be back at the Irish Open in 2012. Picture by Fran Caffrey www.golffile.ieThere will be no PR disaster after all. Rory McIlroy has confirmed that he will tee it up in the 2012 Irish Open from June 28 – July 1.